by Manning, Gerald L.; Ahearne, Michael; Reece, Barry L.
For courses in Sales and Personal Selling. MyLab™ Marketing is an online homework, tutorial, and assessment program designed to work with this text to engage students and improve results. Within its structured environment, you practice what you learn, test your understanding, and pursue a personalized study plan that helps you better absorb course material and understand difficult concepts. Michael Ahearne is Professor of Marketing and C. T. Bauer Chair in Marketing at the University of Houston. He is also Executive Director of the Sales Excellence Institute (SEI). The SEI is widely recognized as the leading university-based sales institute in the world, training more than 2,000 sales students, placing PhD students at top research universities and working with more than 200 major corporations annually. He earned his PhD in Marketing from Indiana University. He has also served on the faculty at the University of Connecticut and at Pennsylvania State University. In addition, he has lectured internationally about sales and sales management in such countries as Austria, Belgium, France, Germany, India, Italy, Spain, and Russia. Dr. Ahearne’s research has focused primarily on improving the performance of salespeople and sales organizations. He has published over 40 articles in leading journals such as Journal of Marketing, Journal of Marketing Research, Management Science, Strategic Management Journal, Journal of Applied Psychology, and Organizational Behavior and Human Decision Processes. He was recently recognized by the American Marketing Association as one of the 20 most research productive scholars in the field of marketing. His research has been profiled in the Wall Street Journal, Business 2.0, Business Investors Daily, Fox News, INC Magazine, and many other news outlets. Before entering academia, Mike played professional baseball for the Montreal Expos and worked in marketing research and sales operations for Eli Lilly and PCS Healthcare. He actively consults in many industries including insurance, healthcare, consumer packaged goods, technology, and transportation. Gerald L. Manning is an international author, consultant, speaker, and successful businessperson. 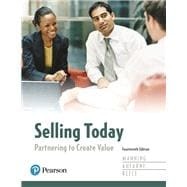 Professor Manning’s book Selling Today: Partnering to Create Value, now in its 14th edition, is today’s international number-one selling textbook on negotiations and partnering. With Chinese, Spanish, International English–Speaking, Canadian, Croatian, and US editions, millions have profited from the strategies and tactics presented. He is author of four additional books on management and sales, all published by large, international publishing companies. Manning also serves as a sales and marketing consultant to senior management and owners of more than 500 businesses, including both national and international companies. He appears regularly as a speaker at national sales and management conferences, and is featured regularly in training videos on sales and management. Professor Manning served as chair of the Marketing/Management Department of one of the leading colleges in the country for more than 30 years. In addition to his administrative duties, he has served as lead instructor in negotiations and sales. Manning received the “Outstanding Professor of the Year” award given annually by his college. He has also applied numerous negotiation and personal selling principles and practices as owner of a very successful commercial and residential real estate investment, development, and management company. Manning’s speaking and classroom experience, along with his consulting, and the management of his company have provided him a unique opportunity to research, study, test, refine, and write about personal selling. With this background, and a long-term partnership-type relationship with acclaimed training video producer Arthur Bauer, the Adaptive Selling Training Video Series was produced. Barry Reece is Professor Emeritus at Virginia Polytechnic Institute and State University. Prior to joining the faculty at Virginia Tech, he held faculty positions at Ellsworth Community College and the University of Northern Iowa. Over the years, he has served as visiting professor at the University of Iowa, University of Missouri, University of Nebraska, University of Colorado, and Wayne State College. He is the author or coauthor of six college textbooks that have been through a total of 41 editions since 1980. Dr. Reece received his EdD from the University of Nebraska. He has been actively involved in teaching, research, consulting, and designing training programs throughout his career. He has conducted more than 500 workshops and seminars devoted to leadership, human relations, communications, sales, customer service, and small business operations. He has received the “Excellence in Teaching Award” for classroom teaching at Virginia Tech and the “Trainer of the Year Award” presented by the Valleys of Virginia Chapter of the American Society for Training and Development.